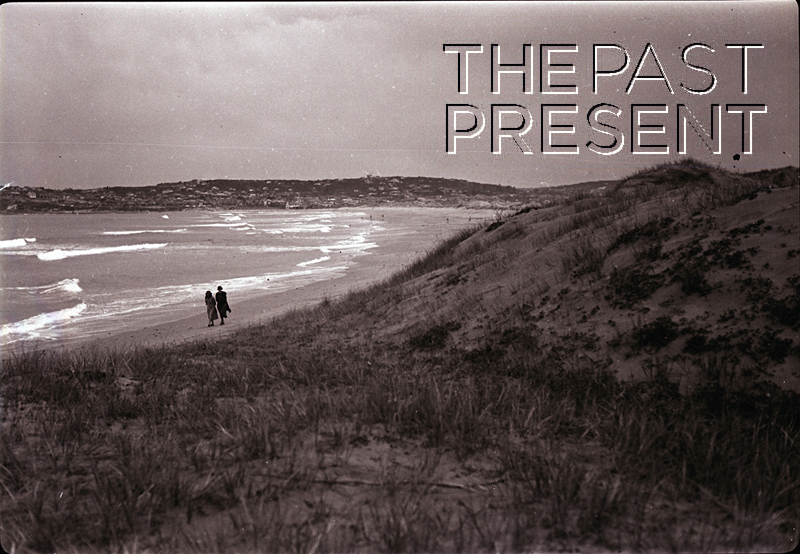 This week, The Past Present is doing something a little different. Normally, the focus of posts is the place depicted in an image, but the image above has another story to reveal. 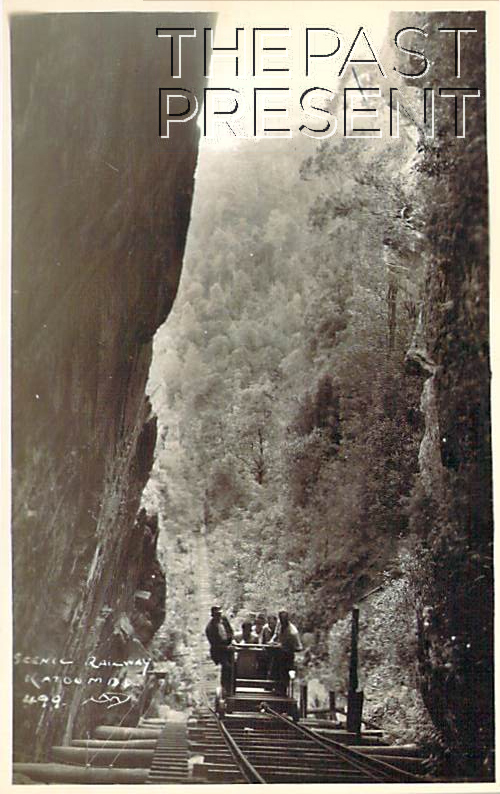 The image, which comes from a postcard, was drawn by Douglas Fieldew Pratt, who was once a famous postcard artist. Douglas Fieldview Pratt was born in 1900 in Katoomba, the son of the resident minister at the Congregational Church. In fact, he was apparently born in the Manse! As a young man his first job was working as a jackeroo near Singleton, and this is when he developed a love for the Australian landscape. It was this love which was to underpin his later career as an artist. In 1922 he moved to Sydney and became a surveyor, and it was when he was working for the Metropolitan Water, Sewerage and Drainage Board in 1925 that his ability as an artist was first recognised. One of his colleagues saw his sketches and suggested he work to develop this wonderful skill. He also sold some paintings that year, and these two events encouraged him to take classes at the Royal Art Society and Sydney Long’s Etching School. Pratt used a variety of mediums in his work, ranging from oil paintings to simple pencil sketches, but it was perhaps his etchings and pencil drawings which became most famous. His first exhibition was in 1928 at the Macquarie Galleries in Sydney, but he went on to exhibit Australia wide, and there are representatives of his works in galleries in Sydney, Melbourne and Perth. The strangest thing about his work though are his postcards as nobody seems to know the story behind them. It seems that they were produced in the 1930s or 1940s, and there is a series of at least nineteen different images that I can find. All depict Sydney and all are black and white letterpress prints of detailed sketches. The mystery though is were they commercially available as postcards in the various public shops, or only available as souvenirs at art galleries? This week, with the weather so cold and unpleasant, The Past Present is turning our attention to warmer and perhaps more pleasant times. In warm weather, many Sydneysiders and visitors to the city flock to the beautiful beaches, yet in the past there was far more to some of these beaches than simply sand and sea. Coogee Beach is but one example. Coogee as a word appears to come from an Aboriginal word meaning ‘bad smell’, which may well refer to the decaying seaweed which is to occasionally be found washed up on the beach. Yet despite the perhaps less than flattering name, Coogee has long been a popular Sydney beach. As far back as 1832, European colonists were coming to the beach, and before then Aboriginals were very familiar with the area. 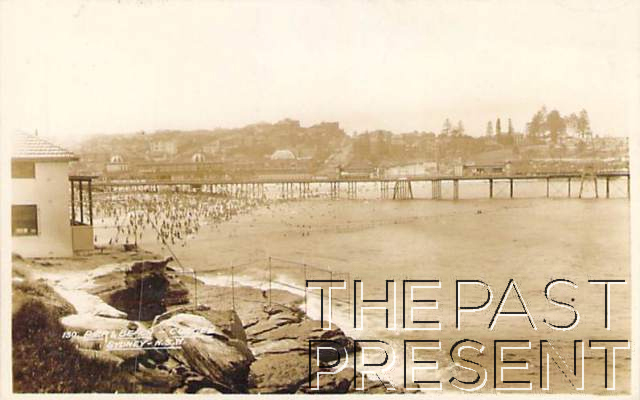 In 1838 the village of Coogee was gazetted, and the future of the beach seemed assured and as surf bathing began to rise in popularity, Coogee became a popular destination. Yet beaches were not just a place to laze on the sand, build castles, swim or catch a wave. In 1928 an amusement pier was even opened, as seen in the image above. The amusement pier was similar to amusement piers in England, and it actually reached out 180 metres into the sea itself. The pier, while it was still in operation, offered a large theatre and a ballroom with room for 600 dancers as well as a restaurant for up to 400 people. In addition, there were a number of smaller shops and even a penny arcade. Sydney seas are not so forgiving apparently as English seas though, and in 1934, only six years after it was opened, the pier was demolished due to safety concerns. This week, the Past Present turns its attention to Martin Place. With plans to redevelop the ‘heart of the city’ featuring on local news programs recently, it appeared the perfect time to more closely investigate past changes to this iconic Sydney location. The history of Martin place is full of change and redevelopment. In its earliest incarnation, Martin Place was a far cry from the grand pedestrian precinct we recognise today, instead being a narrow lane which connected Moore Street to Pitt Street. Despite plans to open up the Northern Frontage of the newly built GPO, the narrow lane way remained until fire destroyed many of the properties along the lane. Following the fire a widened street was created, called Martin Place after Sir James Martin. The street was still relatively short though, until in 1921 Moore Street was widened and also renamed Martin Place, extending the street quite significantly. 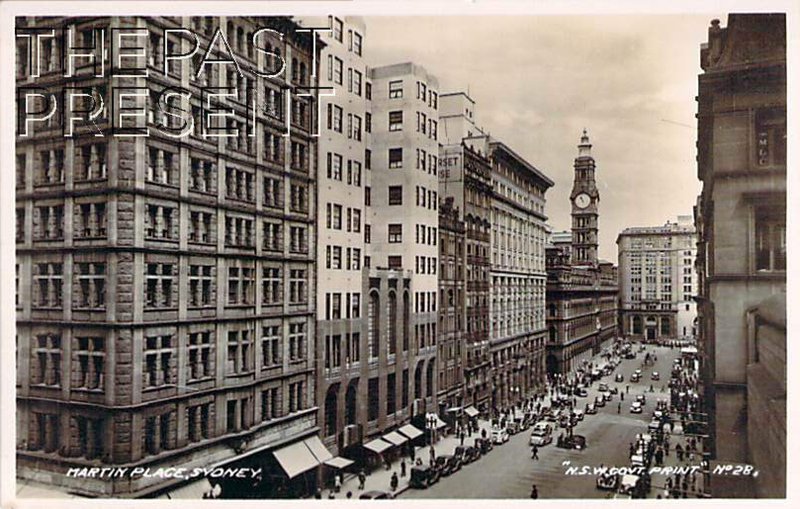 Further extensions were made over the following years, and eventually, when these were completed in 1935, Martin Place ran the full length between Castlereagh Street and Macquarie Street. Martin Place of this era, though a much grander street than the early lane way, was still a long way from being the area we recognise today. At this time, the street was promoted as the financial and insurance centre of the city, and it was full of not only thriving businesses, but also cars, as the image above shows. In fact, the famous Cenotaph, which had been completed in 1927, was almost a median strip, separating the busy traffic which traversed the street. Then, in the late 1960s, proposals to close Martin Place to traffic began to become increasingly popular. The first stage of the new pedestrian plaza was opened in 1971, with the entire plaza completed in 1979. The image above is a glimpse into the past of Sydney, and at a building which today looks vastly different to the one which once stood proudly at the heart of Sydney’s commercial district. 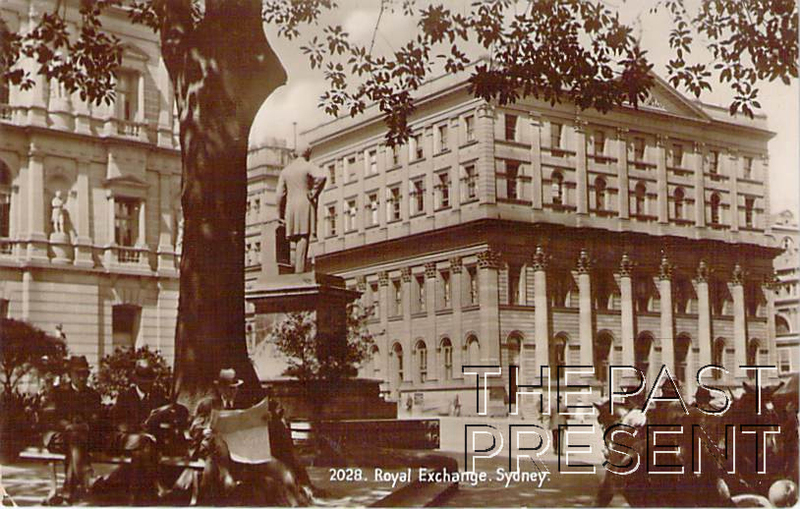 The Royal Exchange may still have a building, and even stand in the same position, yet nothing remains of the original sandstone building – today we see a modern construction like so many others of Sydney’s buildings. The Royal Exchange building, as seen in the image above, was officially opened in 1853. It stood on the corners of Gresham, Pitt and Bridge streets (where the new Royal Exchange Building still stands today) and was just one of the buildings which demarked this areas as the financial heart of Sydney in the 19th century. The Royal Exchange was an important building, acting as Sydney’s first stock and wool exchanges. The Royal Exchange was also the first building in Australia to set up a ‘Telephone Bureau’, installing Australia’s first switchboard in 1881. Subscribers to the service had to pay for everything from the poles, to maintenance, but the system was a success and just a year later there were 30 telephone lines linked to the switchboard. However, not long after this sign of success, and less than five years after the switchboard was installed, an electrical short circuit burned out the original switchboard during a thunderstorm. The Royal Exchange decided against installing a new switchboard, handing the business over to the General Post Office instead. None the less, the Royal Exchange remains Sydney’s and indeed Australia’s first real telephone bureau!